Fresh farmers produce, cakes, meat, fish, plants, herbs, take-away food, coffee & musical entertainment. Fresh produce and wide range of other goods including souvenirs. A monthly market featuring arts, crafts, trash & treasure as well as food and produce. The market features all sort of things, from craft to fruit and veg, to clothing, socks, underwear, shoes, tools, plants ,jewellery, home/garden and a lot more. Exeter Village Market is held at Exeter in the Southern Highlands of New South Wales, a popular destination for weekend visitors from Canberra and Sydney. The area is popular with visitors due to the cool climate and the number of attractions which include a thriving wine industry, national parks, restaurants and beauty of the landscape. The market specialises in local produce and the quality work of local artisans with 45-50 stalls per market set in the Arts & Crafts Village Hall and the lawn outside which is part of Exeter Park which is surrounded with wonderful oaks, poplars and deodars that shade a number of the stalls. An indoor/outdoor market set in historic Gorman House. This market contains a variety of arts and crafts, food stalls and a farmers' market section. 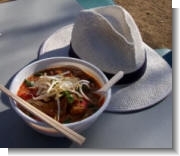 The courtyard setting creates a pleasant atmosphere and White Hat can particularly recommend the Laksa served at this market. Handmade in the Hunter markets features local crafts people, artists and growers with all goods are made, grown and produced in the Hunter Valley/Central Coast area. White Hat can particularly recommend a stroll through the gardens with a glass of wine in hand together with a plate of local delicacies. Featuring local arts, crafts ,produce and wares. Family entertainment with food available. The McGuigan Seasonal Market, Hunter Valley will be presided over by food and wine connoisseur Lyndey Milan. The home of McGuigan Wines will be transformed to accommodate the vibrant farmers market style event and offer visitors an excellent day out with the finest local produce from across rural NSW, alongside wine tasting, live music and entertainment for the whole family. An outdoor market selling both new and second hand goods. Casual stallholdres welcome.